Note: These ten issues are not ranked in order of importance. The need for governments to live up to their human rights obligations, including the duty to protect against abuses involving corporations, has become a growing subject of debate over recent years. As the United Nations Special Representative on Business and Human Rights, Professor John Ruggie, has pointed out, some governments, particularly in developing countries, may lack the institutional capacity to enforce national laws and regulations involving transnational firms doing business in their territory. And even when the will and resources are present, governments may feel constrained from tackling abuses involving companies because of concerns over having to compete internationally for investment. At the same time, home states of major firms operating globally may be reluctant to regulate against overseas harm by corporations, either because the permissible scope of relevant regulation remains poorly understood, or out of concern that firms based in these states might lose investment opportunities or relocate their headquarters. proposal for a UK Commission for Business, Human Rights and the Environment [59 pages, 3.37mb] seek to clarify the responsibilities of home state governments in this area. High-profile cases such as involving Trafigura in Ivory Coast have further raised debate over the need for further action. "This status quo does no favors to victims of corporate-related human rights abuse; to host governments that may lack the capacity for dealing with the consequences; to companies that may face operational disruptions or find themselves in an Alien Tort Statute suit for the next decade; or to the home country itself, whose own reputation is on the line." 2010 will see increasing attention to these issues including through the process of updating the human rights content of the OECD Guidelines for Multinational Enterprises. Clearly the OECD Guidelines and the U.S. Alien Tort Statute mechanisms are important pieces of a larger jigsaw – but it is a puzzle where many pieces are still missing. The challenge of operating responsibly in conflict affected areas continues to be at the heart of debates on business and human rights. Despite path-breaking efforts such as the Voluntary Principles for Security and Human Rights and the Kimberley Process to eliminate trade in conflict diamonds, examples of corporate involvement or exposure to conflict situations abound. One need look only to the news headlines to see the challenges which remain. Rebel forces attack oil pipelines in Colombia. Armed opposition groups abduct contractors operating in the Niger Delta. State security forces ask mining companies for funds or equipment to bring about stability in the area around mines in the Democratic Republic of Congo. Banks receive funds from government officials who may be implicated in grave human rights abuses. These and other conflict related dilemmas cry out for constructive action. It is increasingly acknowledged that the mere presence of large companies can exacerbate a fragile situation that can end up contributing to conflict. But the solution is not as simple as divestment from countries experiencing conflict. Through their presence, businesses can often provide stability and help build peace. But if they act irresponsibly, they may also prolong conflict. A range of initiatives are seeking to address that fact. The UN Global Compact has commissioned new research to highlight how companies can operate in a way that helps peace building efforts. The Red Flags initiative, a joint project of FAFO and International Alert provides guidance to companies of the liability risks they face when they operate in conflict zones. International Alert has also developed Conflict Sensitive Business Practices, which provides guidance to companies in the extractive sector, to operate in a conflict-sensitive way. The Collaborative for Development Action has proposed ways of working that are conflict-sensitive. UN Special Representative for Business and Human Rights, John Ruggie, has recently announced a new initiative to engage key governments in addressing the role of corporations in conflict situations and to develop legal and administrative measures to prevent and address violations in such situations. As the SRSG engages with governments on this issue it will be important to study the experience of companies in delivering services or maintaining civilian infrastructure while operating in conflict zones and to encouraging a process through which agreed principles and practical guidance to companies operating in such high-risk zones can be developed. Nearly 6,000 companies around the world have committed themselves to respecting human rights as part of their involvement in the UN Global Compact. But how much evidence do we have that these or other companies are actually turning voluntary commitments to respecting human rights into actions through due diligence processes? Consider one aspect of due diligence – measuring impact. Despite the developments in this area as captured in reports like the Guide to Corporate Human Rights Impact Assessment Tools by Aim for Human Rights, work in this area continues to follow many diverse approaches to developing the actual methodologies for carrying out due diligence through human rights impact assessments. Important initiatives such as the joint IFC, IBLF, UN Global Compact sponsored Guide to Human Rights Impact Assessment and Management are currently being road-tested with companies from various sectors and is due to be finalized in early 2010. Equally important work by the Danish Institute for Human Rights on Compliance Assessment is helping companies detect human rights risks in their operations. These and other efforts are critical steps forward which build on progress in environmental and social impact assessment work. Innovation and an element of competition in the development of such tools in the area of human rights are clearly desirable. But so too is an element of quality control. In 2010 and beyond, the need to define more precisely what might legitimately be called human rights impact assessments will become more urgent. Further progress in this area will require companies to be as transparent as possible about their findings (balancing the benefits and constraints of disclosure). More will need to be done to ensure the participation of relevant stakeholders with a particular emphasis on the marginalized or vulnerable groups, and future agreed methodologies will need to be practical and effective from a business perspective. More and more business leaders and other stakeholders agree that rapid scaling up of progress on human rights due diligence is a key objective requiring concerted efforts. But the chances that this will occur through market forces alone seem remote. More likely is that renewed state interest in non-financial due diligence (partly as a result of the crisis in the financial sector) will extend to the business and human rights debate. The issue of transparency and inclusion of human rights in sustainability reporting as discussed in two new reports by the Global Reporting Initiative, the Global Compact and Realizing Rights is likely to become increasingly dominant, with strong arguments for a presumption towards much greater disclosure of business impacts on human rights relevant issues. Migration of labour is a complex global phenomenon characterised by opportunity and risk for governments, business and the individuals involved. As the 2009 UN Development report "Overcoming barriers: human mobility and development", points out, well-managed migration offers the potential for substantial economic and social benefits to sending and recipient countries, employers and employees alike. It allows workers to find jobs, business and host governments to overcome labour shortages and skills deficits, while home countries benefit from remittances and upgraded skills of returning migrants. However, abuses of migrant workers and their families remain widespread and legal protection is often inadequate. Reports by organizations such as Human Rights Human Rights Watch on migrant worker exploitation in China and Saudi Arabia highlight the scale of the problem. The ongoing economic and financial crisis has accentuated the economic, social and political challenges associated with migration, resulting in a rise of anti-immigrant sentiment and wide-scale loss of jobs among migrants who often lack the protection of a welfare safety net, as well as significant decreases in income for poor home communities dependent on remittances. As reports by leading organizations including BSR, Oxfam and the Ethical Trading Initiative point out, business has an important role to play in debates surrounding the management of migration at policy level as well as protection of migrants in the workplace. The management of migration lends itself to collective action. Yet no UN body exists explicitly to oversee migration at a global level and while NGOs campaign actively on the plight of migrants they have little sanction. Several international agencies do have a vested interest in matters concerning migration and persons trafficked as migrant labourers, and bilateral trade and investment agreements have the scope to address the issue in a meaningful way. If key stakeholders with real leverage from the private, state and voluntary sectors can join forces to address common concerns, there is real potential to effect positive change. In 2010, the Institute for Human Rights and Business and the International Business Leaders Forum will launch a series of roundtables bringing companies together with government and civil society organisations to address the role of business working collectively towards improving the management of migration and protection of migrant workers in key areas of risk. This joint initiative will focus on key industry sectors where migrant labour is integral to business and where abuses can arise in the absence of appropriate policy and practice: the hospitality sector (with particular focus on recruitment of agency workers) and manufacturing sector (worker protection in supply chains). Addressing challenges relating to migration – and engaging business as a key actor in finding solutions – is sure to be a growing issue of importance in 2010 and beyond. Corporate law, like other domains which shape business practice, has remained largely outside of discussions relating to human rights. How might corporate law be used as a tool to establish clear obligations on corporate directors or for managers to take into account human rights impacts of their businesses? Recent national developments point to potentially closer links between corporate law and human rights in the year ahead. For example, Danish legislation adopted earlier this year requires major companies to report publicly on their Corporate Social Responsibility programs. In the UK, the revised Companies Act now requires directors to "have regard" to issues such as "the impact of the company’s operations on the community and the environment" as part of their duties towards the company. Similarly, the South African Companies Act allows the Government to prescribe social and ethics committees for certain companies. And in India, a new companies bill includes provisions requiring all publicly listed companies above a certain size to "consider and resolve the grievances of stakeholders". The UN Special Representative on Business and Human Rights (SRSG), Professor John Ruggie of Harvard University, announced an initiative in early 2009 to explore what is currently expected of companies under corporate law as it relates to human rights. An expert consultation was held earlier this year involving representatives from leading law firms from around the world who have volunteered to survey corporate law provisions in over 40 jurisdictions. The project seeks to document how human rights are currently addressed by companies and their officers, explicitly or by implication, in laws and guidelines relating to incorporation, directors’ duties, reporting, stakeholder engagement, and corporate governance generally. The review also aims to report on how corporate regulators and courts apply these laws and guidelines, and whether legal or policy reform is being considered. 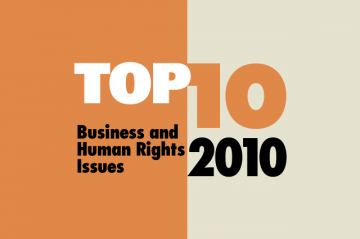 Using corporate law as a tool in influencing business leaders to ensure respect for human rights will likely be a growing feature of business and human rights debates in 2010 and in the years that follow. The global financial crisis which began in 2008 has had a devastating impact on human rights. The World Bank predicts that as a result of the crisis, 89 million more people will be living in extreme poverty by the end of 2010. The International Labour Office forecasts an unprecedented increase in unemployment globally and points out that even if an economic recovery begins to take hold in the coming months, a global jobs crisis could linger for the next six to eight years. The free flow of capital was supposed to eliminate inefficiencies and increase prosperity. Undoubtedly, that has happened in many countries and millions of people have been lifted out of poverty as a result. But those who are making rapid financial decisions continue to act without regard to human rights. The International Finance Corporation has a set of principles, policies, and safeguards for lending to help ensure investments do not undermine labour rights, social and environmental standards and human rights. But are existing efforts sufficient to prevent future financial crises? It seems certain that the time ahead requires further proactive strategies to help put the global financial sector on a sounder economic and ethical footing. The role of business as a potential advocate for human rights goes back to the preamble of the 1948 Universal Declaration of Human Rights which affirms that "every individual and every organ of society" has a responsibility to promote respect for human rights. But how, in practical terms, should business promote human rights? Companies can and do take collective positions on issues – for example, by encouraging other businesses to engage in applying human rights in their management systems. Examples over recent years include cross-sector business groups – such as the Business Leaders Initiative on Human Rights and the newly formed Global Business Initiative on Human Rights which seek to engage on human rights issues both within company operations and as part of broader debates on corporate social responsibility. Positions taken by the International Chamber of Commerce and the International Organisation of Employers in 2008 can be seen as advocacy in support of the conclusions of the Special Representative of the United Nations Secretary General on Business and Human Rights. A number of national business associations and sector-specific business groups have also spoken on behalf of integrating concern for human rights into business operations. Such collective lobbying activities are not, however, the only thing expected of business by an increasingly vocal civil society in many parts of the world. As is increasingly seen in global events such as the lead up to the 2008 Olympic games in China, activists are increasingly calling on global business to speak out on human rights issues. There is a wish to see as well that specific companies or business leaders intervene on urgent human rights issues in countries where they operate. Sometimes this affects business operations or the workforce directly. In other cases, speaking out may relate to specific human rights defenders or victims who might not have any immediate connection with the company. Growing attention to the appropriate role businesses can or should play in countries experiencing wide-spread rights abuses such as in Myanmar, Sudan or Zimbabwe – may be seen as the price of demonstrating 'positive engagement' and continuing operations in such countries. New initiatives such as the UN Global Compact’s work to provide guidance to companies operating in high-risk countries and to those facing calls for more public positions on human rights issues generally point to growing demand for greater clarity on what is an appropriate human rights advocacy role for business. Billions of people use the Internet each day. Security, openness and privacy on the Internet have become critical issues as a result of the explosive growth in online traffic around the world. The implications for human rights are enormous and will require further engagement between governments, business and civil society in the years ahead. New multi-stakeholder efforts are seeking to address the myriad challenges involved. The Internet Governance Forum, established to support the United Nations Secretary-General in carrying out the mandate from the World Summit on the Information Society (WSIS), is a new multi-stakeholder space for policy dialogue in this area. In its first years of existence, the IGF has addressed a range of issues from ways to accelerate the availability and affordability of the Internet in the developing world to addressing valid security measures and those established by governments to collect data for control and suppression. Companies in the Information & Communications Technology (ICT) sector are on the front lines of this emerging issue and face government pressure in some countries to comply with domestic laws and policies which may conflict with internationally recognized human rights standards relating to freedom of expression and privacy. The growth in social networking and other online sharing of information is also a challenge for the industry, as it may put individuals, particularly children, at risk as targets for identity theft and other forms of abuse. An important multi-stakeholder effort to tackle such challenge is the Global Network Initiative, set up in 2008 by a group of companies, civil society organizations (including human rights and press freedom groups), investors and academics. The Initiative has sought to shape a collaborative approach to protect and advance freedom of expression and privacy in the ICT sector, and participants are now putting in place the structures that will carry the work forward in the years ahead. These and other initiatives will test the extent to which the Internet can truly become a space which ensures security but also confidentiality, integrity and availability of information in a global environment. The range of human rights implications linked to access to water, particularly in areas of water scarcity as well as in contexts of pollution of aquifers or rivers by business activity, remain largely unexplored. Many business sectors rely on access to water and a growing number are involved in water management in countries around the world. How should consensus on issues relating to the role of the private sector concerning water be shaped and how might rights-based approaches support such efforts? Water is a precious resource, nature’s bounty, and in theory accessible to all. Yet there are regions which do not have adequate water, and even when there is sufficient water available, some individuals and communities are denied access. In an effort to operate in ways that are responsible, some businesses have been involved in developing noteworthy initiatives. For example, the World Water Forum brings officials, NGOs, and businesses together to address a wide range of water-related issues. CEOs of leading companies have also come together in the CEO Water Mandate through which they commit to use water responsibly, report on usage, and operate in a transparent manner. The CEO Water Mandate and a growing range of other stakeholders and initiatives acknowledge that water stress is expected to worsen in many parts of the world over the coming years due to a range of natural and inevitable factors. There is growing awareness that business operations can have direct impacts on water management, and that business leaders can influence positive change through their own behaviour and by requiring similar steps to be taken by their suppliers. But significant challenges remain. How should companies operationalize the principle of 'do no harm' – and due diligence standards – in the context of access to water? What is the nature of the conflict between the generally-accepted meaning of “minimum” or “adequate” provision of water for personal use, and the setting of this as a standard? What, if anything, should businesses be reporting in terms of water and human rights? Should companies disclose the amount of water they need, besides the amount they use or purify or recycle? During 2010, the Institute for Human Rights and Business will take forward its path-breaking work [21 pages, 919kb] to engage a range of stakeholders on challenges, dilemmas and opportunities involving the private sector and human rights relating to water. Land is a key resource for communities, governments and companies. Farmers want to grow crops; families want safe places to live; states want to expand public infrastructure; factories want to manufacture; mining and oil companies want to drill; and developers want to build office towers or residential homes. Those involved in developing tourism, new complexes or extractive projects, have all had to deal with individuals and groups – some of them indigenous, others not – who are present on land set for development. Such cases continue to be at the heart of debates concerning business and human rights. Often the communities that live on lands under dispute do not have legal title. They invoke their right to property, but that is a qualified right, in that the state can take over land for public use. Land acquired through eminent domain has in many places been put to good uses – irrigation projects, power plants, roads, highways, railroad projects, all of which support the public good. But too often the state has used force to take over land from communities against their will or undertaken projects for personal gain. Companies have let states acquire land, so that they can focus on their business, and often, in that gap, human rights abuses occur. While good practice requires companies to adhere to the principles of free, prior and informed consent, states have the right to invoke eminent domain to take over land even if the community may not wish to move from the land. This has often resulted in violence. How can companies act in ways that respect rights? Consultation with communities in ways that respect rights is a challenging proposition. Initiatives like the Collaborative for Development Action have sought to integrate rights concerns in their efforts. Organizations like Monkey Forest have developed plans that can help companies to operate in a responsible way. Stakeholder consultation is never easy, but useful tools are being developed by projects like ConflictSensitivity.org for companies and others involved in land related issues. The Institute for Human Rights and Business has also embarked on a multi-stakeholder process to develop further guidance relating to land rights and the role of the private sector. Achieving greater consensus on these issues is a key business and human rights challenge still requiring action.